As expected, the Federal Reserve raised its benchmark interest rate again this week. And while its new chairman Jay Powell didn’t mention any major changes in monetary policy from his predecessor Janet Yellen, the dot plot does reveal the Fed’s plans to squeeze in one more rate hike next year. A sign of acknowledgement that it could still end up behind the curve. The Fed dot plot above reflects the short-term interest rate levels deemed appropriate by the voting members of the Federal Open Market Committee. 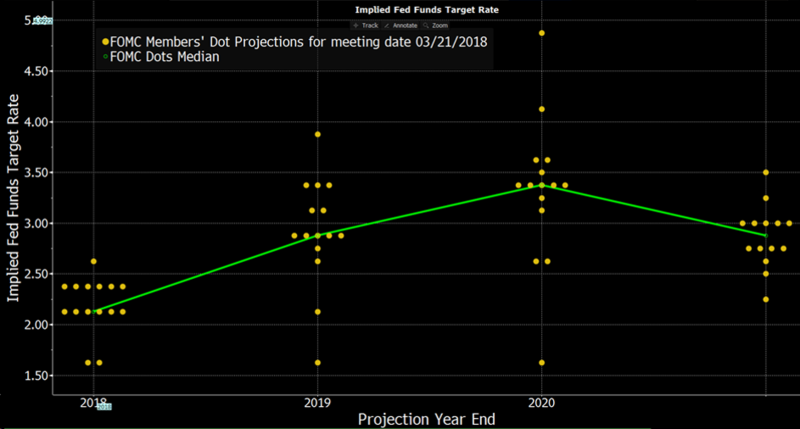 Compared to last December’s dot plot, the Fed now expects to implement three rate rises in 2019 instead of two. Together with the two remaining rate hikes this year and two additional hikes in 2020, this will raise the federal funds target rate to 3.50%. The rate will then have increased 3.25% since the beginning of this tightening cycle, which started back in December 2015. As it happens, this is exactly equal to the average, cumulative rate increase during the last five hiking cycles going back as far as 1983. However, this Fed tightening cycle is far from average. For example, it’s already 900 days long and yet rates have gone up just 1.50%. By way of comparison, the longest hiking cycle to date spanned 1189 days (Dec ’76 – Mar ’80), during which period the target rate was raised a whopping 15.25%. In view of the latest dot plot data, the present cycle is very likely to become the longest and slowest hiking cycle in history. The reason for this seems pretty straightforward. Contrary to previous hiking cycles, the Fed also needs to get rid of a huge amount of other stimulus. 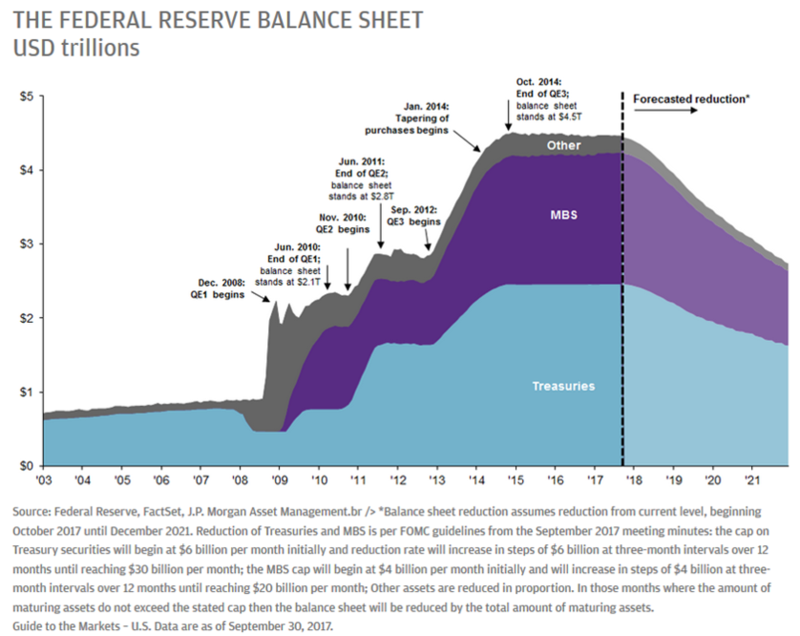 The Fed’s balance sheet has more than quadrupled since the outbreak of the financial crisis, as a result of the vast quantities of government and corporate bonds it bought to stimulate the economy. But the economic circumstances have improved significantly since then, so the Fed must now reduce its balance sheet. As the chart below shows, this is now happening at a very gradual pace, but will accelerate as time progresses. While the Fed’s decision to abort its extremely loose policy so slowly might be understandable, given that the abundance of liquidity has reached every outskirt of the financial markets and would cause considerable volatility if reversed abruptly, it does not come without risks. US headline inflation currently stands at 2.2%, and has consistently topped the 2% threshold in the last six months. Core inflation is at 1.8%, officially below the Fed’s target, but not far off. In addition, US unemployment is down to 4.1% – its lowest level since December 2000 – and expected to fall further as the economy continues to grow. For this year, economists predict that the US economy will grow 2.8%, the second fastest pace since 2005. And expectations for next year are that GDP growth will level off somewhat but remain very healthy. 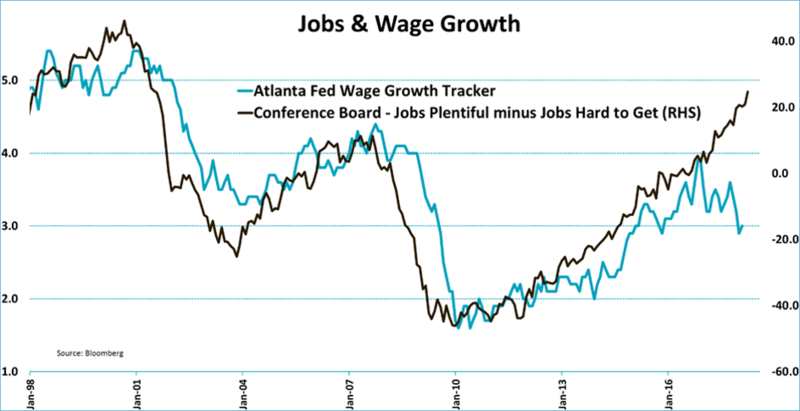 The only thing missing so far is wage growth. 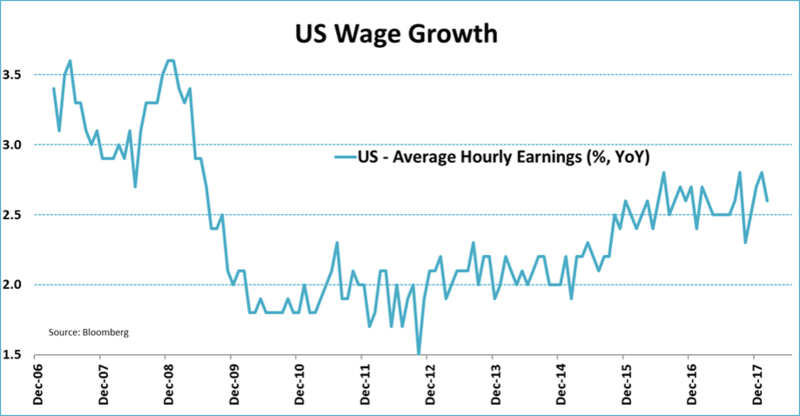 Wages are undoubtedly rising at a decent pace, but not to the extent that they can structurally help push inflation towards the Fed’s target. This is partly explained by the relatively high number of part-time workers and low participation rate. However, this could change going forward. Jobs are already harder to come by in a number of sectors, and companies are starting to hire more full-time employees. Added to this is the fact that more people who weren’t looking for work before are re-entering the labor market, raising the participation rate and reducing the little slack there is left. We believe that it’s the combination of a healthy economic outlook, a tightening labor market and the abundance of liquidity still in the financial markets (increasing the odds of inflation overshooting) that has forced the Fed to add at least one more rate hike during this cycle. So, what does the Fed’s persistent policy of monetary tightening mean going forward for the bond markets? To cut a long story short, we think that bond yields will go up. Not just in the US, but in other parts in the world as well. In fact, we could see bigger yield increases outside the US. Where US bond yields have normalized to some extent, other major central banks such as the Bank of Japan and European Central Bank have yet to end their extraordinary policy measures. As a result, the gap between US and German bond yields, for example, has grown extremely wide. We expect this gap to decrease over time.